Please post your comments and questions of the 4S Universal Tube Preamp Project (12A*7) in this thread. 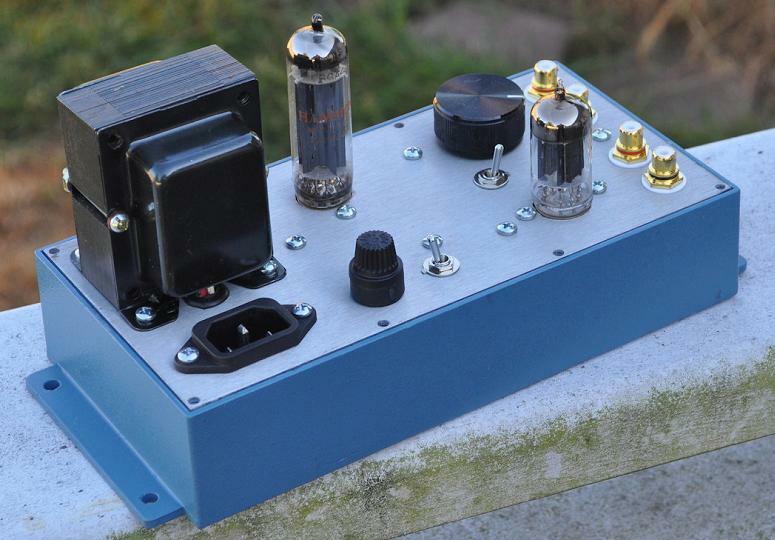 For alternate power supply ideas see Mark's 4S Universal Valve Preamplifier builds. Load lines for the various 12A_7 tubes with the Universal Preamplifier circuit are attached in this forum post. Hi, Nicely done. I have always wondered if the very early tube designers planed on being able to use the same value of cathode resistors for biasing most of the tube with the 12A_7 base. How did you determine the distortion levels? Distortion levels are theoretical and determined in the usual way via ratios of plate current values at specified conditions. I really should post the load line designs for the various tubes; in the interest of education. Thanks to Matt and everyone for this community and the body of work that is developed by it. It truly is a joy coming here, learning and building! I built a unit using Matt's PSU today. I am a tube amp beginner and would like learn more charactistics of valves, this schemetic and Matt's testing result is very helpful to me. The sound is clear and dynamic . I would like to reproduce your results with my unit, but I don't know what equipments should I need? I have a multi-test meter, an audio generator and an oscilloscope. I would like to reproduce your results with my unit, but I don't know what equipments should I need? I have a multi-test meter, an audio generator and an oscilloscope. The best way to take the gain measurements if you don't have a wide-band AC voltmeter is to read voltages directly off of the oscilloscope. Just make sure to periodically zero the inputs to make sure that the traces are still baselined to zero volts. The phase measurements are slightly more problematic. The way I did it was to use a plotting compass and take measurements of the relative zero crossings between the input and output waveforms accounting for the 180deg mid-band phase shift. If you take a measurement, divide it by the length of one full cycle, and multiply by 360, you get the relative phase shift in degrees. Then just repeat both procedures at a number of frequencies to generate the response plots. Clean and neat build, very smart.